Hundreds of miles from the nearest tree, the Tree of Ténéré was a vital navigational waypoint in the heart of the Sahara. It marked the route between Niger and Algeria until it was knocked down by a Libyan trucker in 1973. 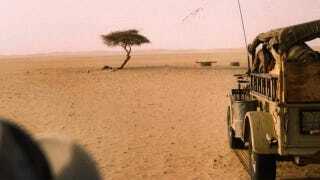 A short while ago, my good friend Feri and I were looking at his set of beautiful Michelin road maps of Africa, and there it was, a lone but very much marked speck in the Ténéré region of the Sahara in Niger, the world’s loneliest tree. Trees are not known to be features on small scale maps which show half a continent, but this one was. Or, at least, its memory was. The Tree of Ténéré was an acacia, dating back to when northeast Niger was a wetter place, its companions long killed off by the advancing desert. With roots reaching down 110 feet to hit the water table, it was for decades the only landmark in the featureless waste of sand dunes, more than enough to warrant a place on the Michelin map. The tree is gone now, dead since a collision with a drunk Libyan trucker in 1973, and it is on display at the national museum in Niamey, the capital of Niger. A remarkably ugly metal tree stands in its place, little more than a sad, brambled pole, with none of the rueful grace of the Tree of Ténéré.